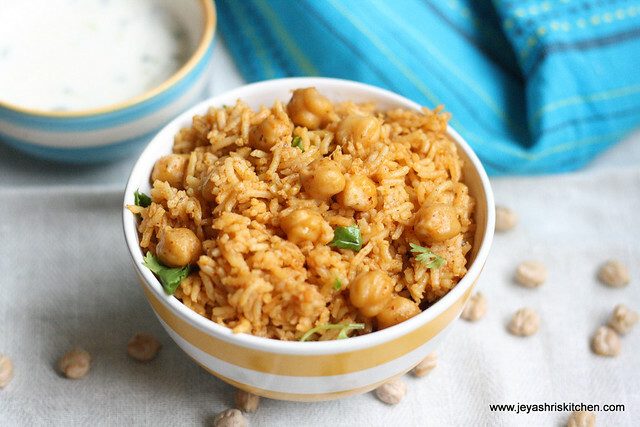 PULAO MADE WITH CHICK PEAS. A very simplest way of making pulao, which i started making for my daughter when she was 3 years old. She is a big fan of chick peas. Now a days, though i make this once a week for her lunch box, in the morning hurry i never had a chance to take stepwise pictures. 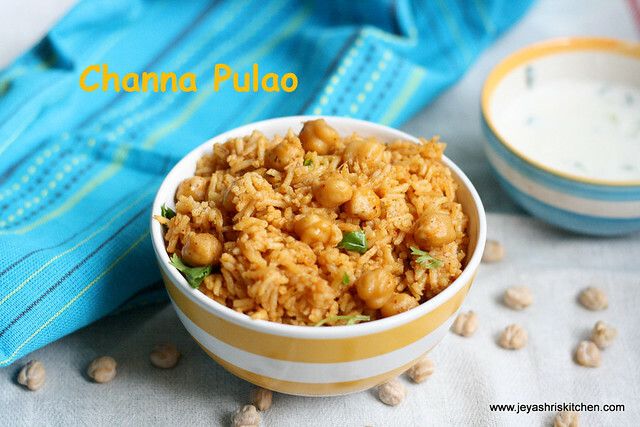 Somehow i managed to click this today and here comes the recipe for a Simple and Delicious Channa Pulao. Wash the rice and soak it in 1 and 1/2 cup of water for 20 minutes. In a pressure cooker, add oil and ghee. Now add the onions and saute till it turns pink. Add the tomato and saute till they becomes mushy. Now add the potatoes and fry them for a minute. Drain the water from the chickpeas and add it to the onion tomato mix. Now add the rice with water. Add the biryani masala,turmeric powder ,redchilli powder and salt to this. I used SHAN biryani masala. You can use anything of your choice. Close the lid of the cooker and pressure cook till 3 whistles. Mix it gently without mashing the grains. Garnish with coriander leaves and serve hot with raitha. Channa pulao looks super delicious,inviting and truly droolworthy, love channas in rice..
My fav...ur version sounds pretty good and tempting. Perfectly cooked rice too! That's one tempting bowl of rice...I too make this often and the bowl vanishes in no time...love the picture..each grain is looking fluffy and perfect. I make a diff. 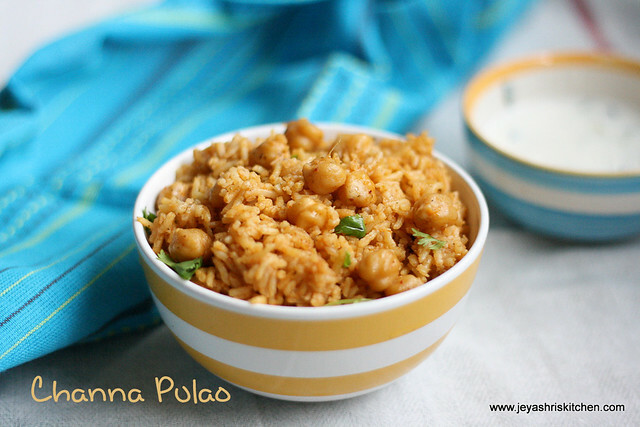 version of channa pulao.. this seems nice and easy. Has come out perfectly. Its very yummy...looks great !! Pulao looks so inviting and wonderful !! Looks great and yummy one pot meal! I love chickpeas and this pulao looks delicious. Looks yummy!!! We use Shan ,asala too but do it with soya chunks>>. I always flop when it comes to channa pulao, looks perfect! can we use red chilli powder n garam masala if we dont have biryani powder? Hi Jeyashri, I tried this recipe and it came out great! Thank you!! I have mentioned in the post itself too. Soak rice in 1 and half cup water for 20 minutes. should we use coconut milk for water to pressure cook ??? Yes you can add, but replace half of the water with thick coconut milk.